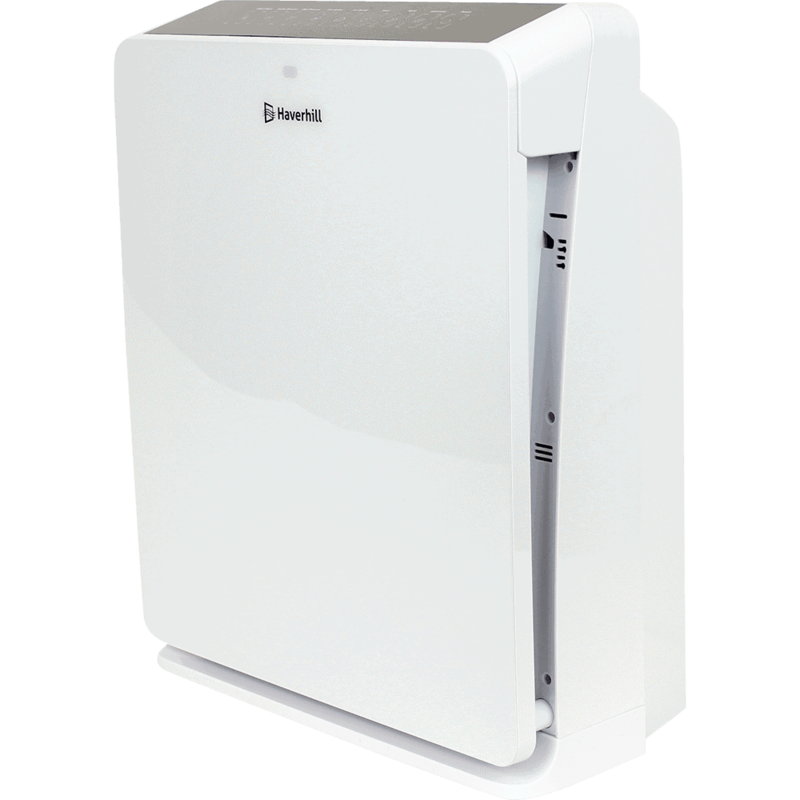 The Haverhill HAP52010E is a true-HEPA air purifier. It has one of the best price/performance ratios. 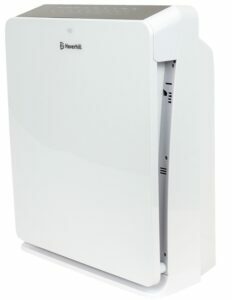 This air purifier costs around $100-$170 and is made for rooms up 538 square feet It has 6 fan speeds, air quality indicator, and many other features. The Haverhill HAP52010E looks very stylish. It is in white color. This medium size unit is very practical. You can place it close to the wall because air outlet is on the top of the unit. Depth is only 9.8 inches (25cm). Height is 17.7 inches (45cm), width is 20.7 inches (52.5cm). You can also put this unit on the desk or shelf. The weight is only 15.4lbs (7kg). Carrying handle makes it easy to move from space to space. 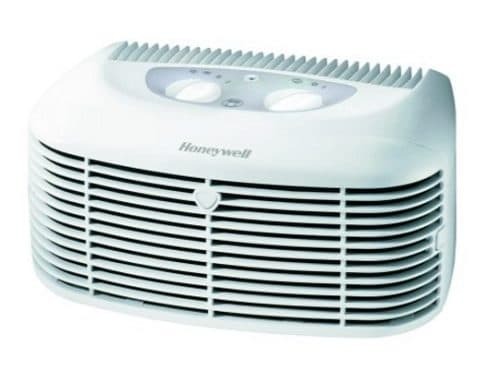 The Haverhill HAP52010E air purifier has a fan and air is moved through a 3-stage filtration system. First is large particle pre-filter. It removes large particles like pet hair, smoke particles, and larger pollen spores. It is washable. As this filter is first that meets polluted air, it gets dirty faster. For best results clean it regularly. Next is the main filter – true-HEPA filter. It captures 99.97% of allergens and other pollutants as small as 0.3 microns. This includes pollen, mold spores, dust mites, pet dander, smoke particles. The last one is activated carbon filter. And this unit uses one of the best carbon filters in its price category. It is thicker than filters used in competitors air purifiers. It removes more odors from cigarette smoke, pets, and cooking. The Haverhill HAP52010E has really stylish digital controls. Each button has a name on it and specific symbol. Remote control. With it, you can enable or disable all functions. Automatic mode helps you to choose right speed. Smoke removal mode – use it when smoking or if you have smoke odors caused by cooking. Odor removal mode – targets common household odors such as those from cooking and pets. The timer option allows you to select how long the air purifier will run before it automatically shuts off. choose between 2, 4, 6 or 8 hours. Night Mode. When set to Night Mode, the display panel lights will dim and the unit will not go above low fan speed to help keep the room dark and quiet. Energy Star operation means it operates efficiently and saves you money in the long run. Speeds 1 is very silent. Speed 2 and 3 also is silent. Speed 4 to 6 are louder especially the last one. I couldn’t find CADR for this air purifier. But manufacturers homepage specifications says an amount of air moved (Max CFM): 260. 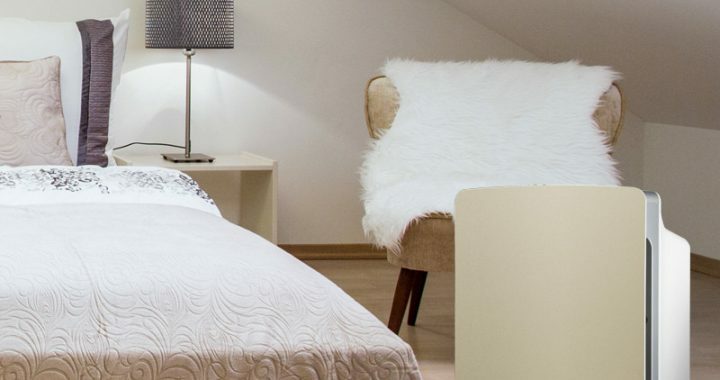 Recommended max space is 538 square feet. Ceiling height is 8 feet. 538×8=4304. 4304/260=16minutes. 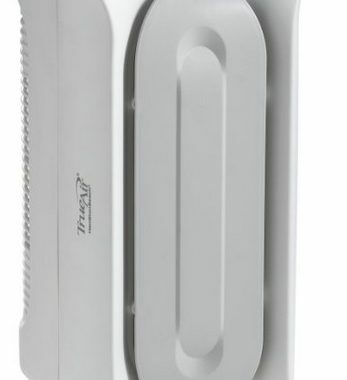 That means all air in your room will be filtered through the air purifier 4 times/hour. Pre-filter should be cleaned every 2 months. For best results, you can wash or vacuum it every month. True-HEPA filter is used 2000 hours in total. Filter check indicator will show when you need to replace it. Carbon filter should be changed together with HEPA filter. Filters replacement is easy – open the front cover, take out the used filters and replace with new ones. The Haverhill HAP52010E is energy star qualified. Maximum power consumption is 60 watts and that’s really nothing. The Haverhill HAP52010E is a really great purchase. It costs around $100-$170, it covers spaces up to 538 square feet. And it has a lot of features such as 6 fan speeds, air quality indicator, automatic mode, night mode, filter check indicator, carrying handle, and even smoke and odor removal modes. Ideal for allergy and asthma sufferers and those with light chemical sensitivities. 6 fan speeds allow you more choice. Air quality sensors and auto mode allow you to sit down and relax. The unit will choose best fan speed and features for you. Shut-off timer allows you to leave home and let your unit work for you. 3-stage HEPA/carbon filtration system eliminates common airborne allergens and odors. Quiet mode is really quiet. If you need heavier odor filtration, choose a model with a thicker carbon filter. 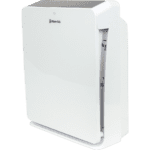 Posted in Air Purifier Reviews, Reviews and tagged Air Purifier review, Air quality indicator, Haverhill HAP52010E, HEPA Air Purifier, True HEPA.